"The Jews! The Jews are to blame!" "The Aryan Volk are the strongest race!" "To eliminate them, that's our aim!" After securing the neutrality of the Soviet Union, Hitler double crossed Britain when he broke from agreement he had made with Prime Minister Chamberlain, who had attempted to appease Hitler. Germany started World War Two by invading Poland on September 1, 1939. Britain and France declared war on Germany on September 3. "Soviet Russia is under my control. I rule with an iron fist." In August, 1939, the Soviet Union and Germany secured the German-Soviet Pact of nonaggression. On June 22, 1941, Germany invaded the Soviet Union under the code name Operation "Barbarossa". We will fight for honor." On December 7, 1941, Japan attacked the United States Naval Base at Pearl Harbor, Hawaii territory. More than 2,300 Americans died. Their attack on lead to the U.S joining the war. How did the U.S respond? What actions did both nations take after the attack? "Every decision is made with this nation in mind." Franklin Delano Roosevelt only got to serve four months into World War Two, and he was succeeded by vice president, Harry S. Truman. Under Roosevelt's leadership, the nation rebounded from the devastating surprise attack at Pearl Harbor in December 1941, nearly achieving victory in both Europe and the Pacific by the time Roosevelt died. "There is no such thing as surrender to the French! Continue to resist the Nazi's." Charles de Gaulle rose up professionally, and became the undersecretary for the defense and war for French leader Paul Reynaud. Then Paul Reynaud was replaced by Petain, who worked out a deal with Germany to avoid further bloodshed. How did Charles de Gaulle react to that, and whact actions did he take? His main goal throughout the entire war was to create an Italian Empire in North Africa. 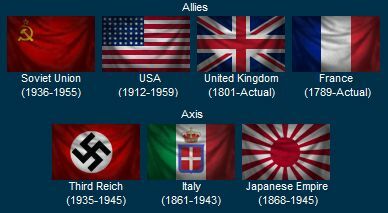 Hitler used Italy as a stepping stone for his conquest in taking over. - Chose to ally Italy with Adolf Hitler. Together they were battling Allied troops on several fronts. These threats we shall diffuse. We'll never let Germany win!" Winston Churchill lead Britain through World War Two. He gave inspiring speeches and refused to give in to the oppressor.